Understanding the distribution, abundance, and habit requirements of a species is basic to establishing a baseline for its long-term monitoring at a particular site. 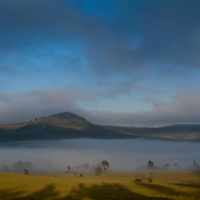 To this end, the Lolldaiga Hills Research Programme recently produced a report titled ‘Distribution and abundance of some of the larger mammals of Lolldaiga Hills Ranch, central Kenya’. This report presents information for 42 of the 54 larger mammals that are known to occur on Lolldaiga Hills Ranch, as well as for two smaller mammals (unstriped ground squirrel and striped ground squirrel). Photographs are presented for 42 species, while distribution maps are presented for 25 species. In drafting a recent article (Primate Conservation in the Rangeland Agroecosystem of Laikipia County, Central Kenya), we became aware that information concerning the geography, environment, and biodiversity of Laikipia County, central Kenya, was (surprisingly) widely scattered, frequently difficult to locate, and sometimes incorrect. We have, therefore, produced a short document that presents some of the more important and most often-sought facts about the geography, environment, and biodiversity of Laikipia County. Plains zebra, Lolldaiga Hills Ranch. Photograph by Yvonne de Jong & Tom Butynski. 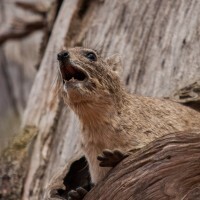 Each species of hyrax (family Procaviidae) has its own unique set of vocalizations. Their advertisement calls are particularly loud and useful in distinguishing species. During our primate surveys in Eastern Africa, we recorded four species of hyrax, belonging to three genera. These are the southern tree hyrax (Dendrohyrax arboreus), the eastern tree hyrax (Dendrohyrax validus), the bush hyrax (Heterohyrax brucei), and the rock hyrax (Procavia capensis). 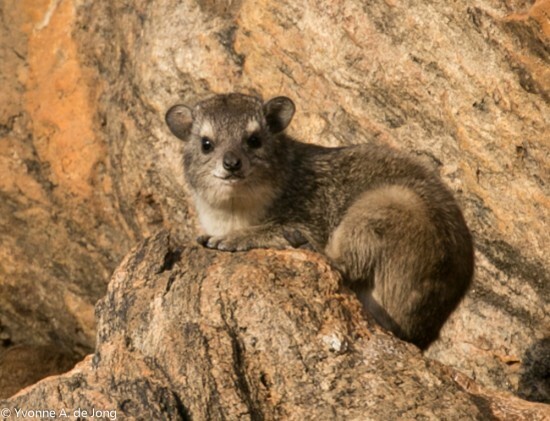 In the near future, we will present the vocal profiles of these four species of hyrax on this website—similar to our vocal profiles of the Galagos. Until that time, we will, gradually, add our hyrax recordings to this page. Bush hyrax (Heterohyrax brucei) at Lolldaiga Hills Ranch, Laikipia, Kenya. Click here to view our Hyrax PhotoMap! There are two species of warthog in Africa, the common warthog (Phacochoerus africanus) and the desert warthog (Phacochoerus aethiopicus). 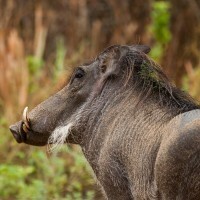 The common warthog is widespread in sub-saharan Africa, including the Horn of Africa (i.e., Kenya, Somalia, Ethiopia, Djibouti, Eritrea). 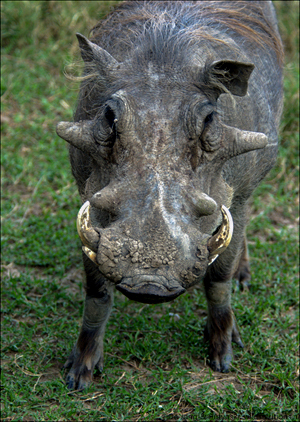 The desert warthog, one of Africa’s least known large mammals, is restricted to the Horn of Africa. Its distribution is, however, poorly understood. 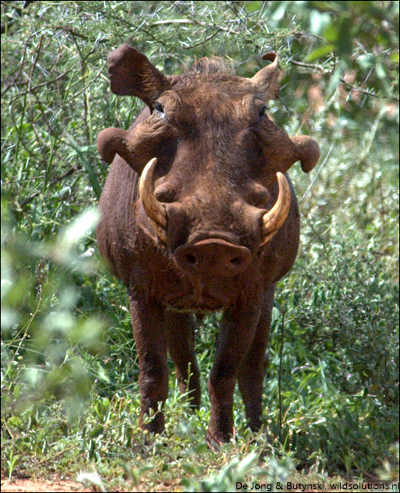 Until recently, observers in the Horn of Africa have not differentiated between the two species of warthog. As such, the limits of the distributions of these two species over the Horn of Africa remains poorly known, as does their conservation status. Adult male desert warthog Phacochoerus aethiopicus in Tsavo West National Park, southeast Kenya. Note the flipped-back ear tips, hooked warts, broad, egg-shaped head, relatively broad snout-disc, and swollen suborbital area (area under the eyes). Photograph by Y. A. de Jong & T. M. Butynski. Adult male common warthog Phacochoerus africanus on the Laikipia Plateau, central Kenya. Note the cone shaped warts, pointed ear tips, relatively narrow snout-disc, and the diabolo-shaped head. Photograph by T. M. Butynski & Y. A. de Jong. 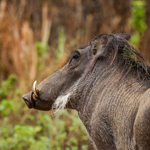 To better understand the distribution of Africa’s warthogs, we would like to know if you have seen desert warthogs or common warthogs in Eritrea, Ethiopia, Djibouti, Somalia, Uganda, Kenya or Tanzania. A photograph and details of your encounter (including date, coordinates, altitude…or detailed locality description) would be highly appreciated. Please email your photographs and the details of your encounter, or post them in the ‘comments’ below. Thank you very much! De Jong, Y.A. & Butynski, T.M. (2014) Distribution, Abundance, Ecology, and Conservation Status of the Desert Warthog (Phacochoerus aethiopicus) in Northern Kenya. Culverwell, J., Feely, J., Bell-Cross, S., De Jong, Y.A. & Butynski, T. M. (2008). A new pig for Tsavo. d’Huart, J.P. & Grubb, P. (2005). A photographic guide to the differences between the Common Warthog (Phacochoerus africanus) and the Desert Warthog (Ph. aethiopicus). 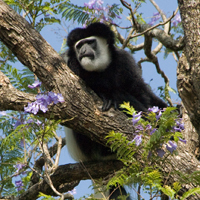 Abstract: The Mount Kilimanjaro guereza Colobus guereza caudatus is considered to be endemic to northeast Tanzania. This paper presents the first records for C. g. caudatus in Kenya, describes the distribution of this subspecies, and assesses its conservation status.